Meet our staff and find out where to direct your community gardening inquiry below! If you are a home gardener in Forsyth County and have a horticultural question, please call the main Forsyth County Cooperative Extension number: 336-703-2850. 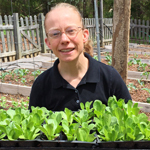 Megan coordinates educational programs for community gardeners in Forsyth County, including the Mentor Program, Forsyth Extension Gardener Series, and technical assistance with garden start-up, community organizing, and sustainable horticulture. She’s also responsible for guiding overall FCG program planning, communications, securing funding and other resources, program evaluation, and reporting. Before joining Forsyth Cooperative Extension in September 2015, Megan worked with community gardeners in Brooklyn, NY to research cover crops and soil quality in urban gardens, and served as an Agroforestry volunteer in Peace Corps/El Salvador from 2004-2008. Derek coordinates Forsyth Community Gardening’s Seed Bank, dispensing vegetable, herb, and flower seeds (and excellent gardening tips!) to community gardeners. 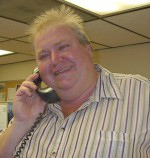 He is also Forsyth Cooperative Extension’s Horticulture Technician, responsible for answering horticultural questions of all kinds (vegetable gardening, ornamentals, and lawns).